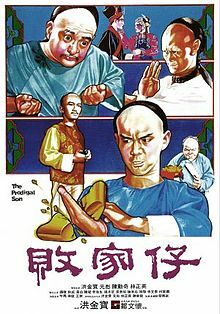 Great classic Wing Chun movie. It is a 1982 film and includes Sammo Hung. The DVD for the Prodigal Son came out around 1993. It has great fighting scenes and is a story about a guy who thinks he knows kung fu until he meets Leung Yee Tai who introduces him to Wing Chun. Also, note this movie is a comedy, so there is some serious martial arts fighting mixed with comedy. Comment by Rob: I agree that it’s a great classic. I think everyone where I train Wing Chun has seen it. Like many early Wing Chun movies, the Wing Chun is sub-par. Which means that it’s more movie fighting than authentic fighting. Don’t try to learn Wing Chun moves by watching The Prodigal Son. But it’s still a classic and a must see if you’re a Wing Chun practitioner or Kung Fu movie fan. Something that strikes me as odd and interesting about this movie is that its has a pretty heavy plot. (I won’t go over it here and ruin it for you). And it has a lot of dead people, blood, murder, and revenge. But it has a lot of comedy - very silly, slap-stick, Three Stooges-type comedy. That really threw me off. I guess this was old school Kung Fu movie comic relief? Maybe using very visual blood and guts was new in the 1980s and they wanted to tone it down with slap stick comedy... so they wouldn't risk screwing someone up mentally? Of course, compared to the blood and guts shown in today's movies, The Prodigal Son's gore is borderline childish. If you've watched The Prodigal Son, tell us what you think below in the comment link. Buy The Prodigal Son on Amazon.